So I have seen a lot online about the new clean + line that Garnier has introduced, and was curious to try it out. They have created a line for dry skin, acne prone skin, and oily skin. They were also giving out samples, which I received one for one of the cleaners. 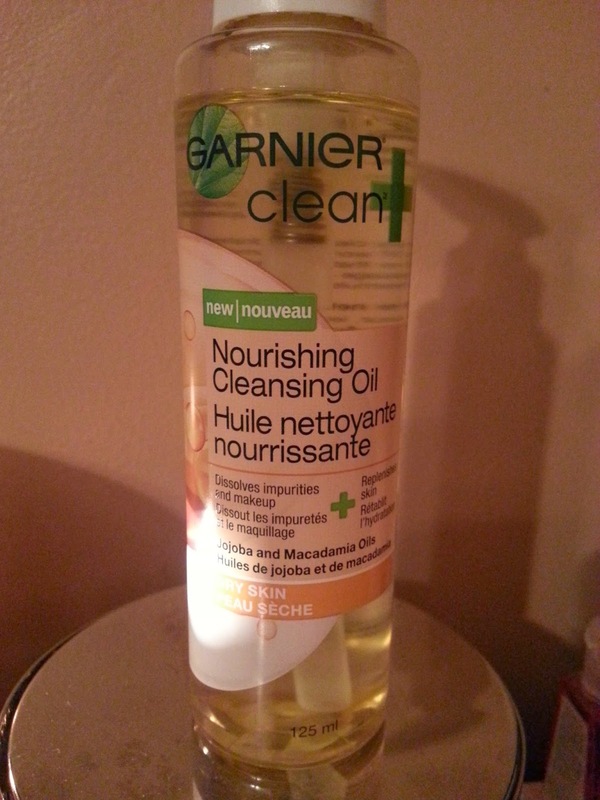 I received a sample in the Garnier Clean + Nourishing Cleansing Oil because I indicated that I have dry skin, and the sample came in the mail pretty quickly. They also sent a $1 off coupon for any of the products if you were to decide to purchase. I tried the sample twice, and decided I really wanted to purchase the cleansing oil. I liked how it cleaned my skin, yet left a moisture barrier. My skin didn't immediately feel dry or tight like it usually does right after I wash my face. 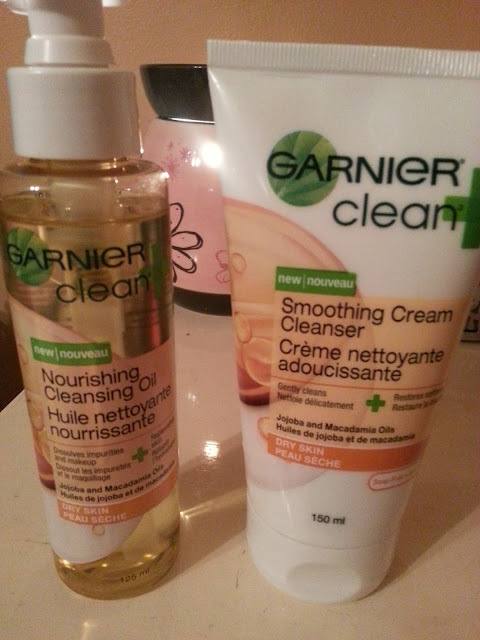 After some research, and reading other reviews, I went out and purchased both the Garnier Clean + Nourishing Cleansing Oil and Smoothing Cream Cleanser, because Garnier suggests you alternate between the two cleansers. Both were on sale at Walmart for only $6.97 each, with a price tag on the display saying they were just over $10 originally. I was a little surprised how small the size of the Nourishing Cleansing Oil really is. I had seen youtube videos and pictures, but it looked a lot larger online than it does in person. I still purchased it though and have used it a few more times. I find I only need 1 pump (it recommends 1-2 pumps) to cover my face. You must make sure your hands and face are completely dry before you try applying the oil. After you have rubbed it all over your face, including your eye makeup, you wet your hands and rub your face. The oil then starts to turn almost milky. Once you have done this, you can rinse your face completely. This does leave a little bit of an oil residue, but I really don't mind. Again, I have really dry skin and noticed a difference immediately. Before trying, I had 2 dry patches on my cheek, that just weren't going away. I was moisturzing the area a lot, and for almost 2 weeks they just wouldn't disappear. I used this cleansing oil ONCE and they immediately looked less dry, and were no longer flakey/patchy. I used it again the next day, and my dry patches are completely gone. If you have dry skin, then I definitely would recommend this product. Never having used an oil cleanser before, I am impressed. I have seen in other reviews that this is not as good quality as the higher end brands, but that's fine with me. This is an affordable price, and it works! 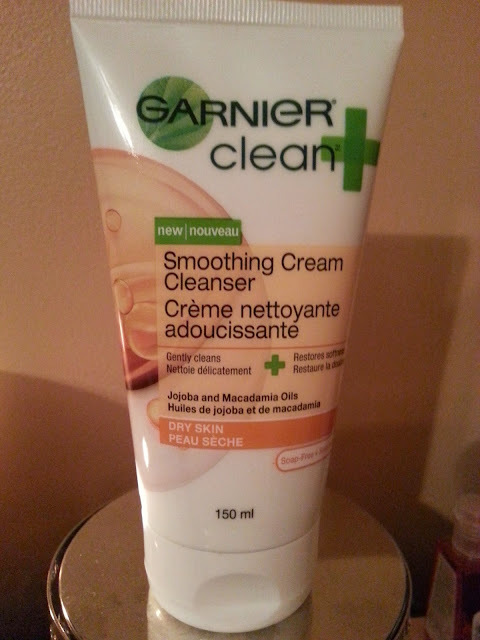 Since Garnier recommends you switch between the oil cleanser, and the smoothing cream cleanser, I decided to purchase the cream as well. I had high hopes for this cream cleanser, because of how well the oil cleanser worked. I usually use a nourishing cleanser from aveeno and was expecting good results, however I must say I was greatly disappointed with the outcome. This formula is just like any other cleanser. You wet your face, lather in your hands, then apply to your face, rinse off. It was really creamy in my hands and on my face, and did lather well. However, immediately after I finished washing my face, I felt I needed to put moisturizer on. The cream doesn't have the "moisture barrier" like the oil does. Between the two cleansers, I really prefer the oil. I can see why they recommend switching between the two though, because the oil might build up too much on your face. If I were to recommend any of them for people with dry skin, then I would definitely recommend the cleansing oil. Give it a try! It's not as scary as it sounds! But for a general cream cleanser, I would suggest using a different brand because there is nothing extraordinary about this one.